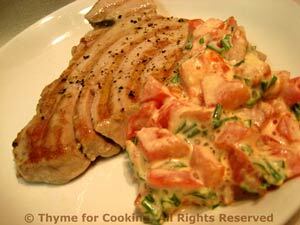 Grilled Tuna, Tomato/Taragon Mayonnaise, Thyme for Cooking easy gourmet. Good tuna doesn't need much fussing: a bit of fruity olive oil, quickly cooked on the barbecue grill and finished with some freshly ground black pepper. In case you didn't know - the very dark part of the tuna is fat, and can taste quite 'fishy'. I don't remove it but I also don't eat it - personal preference. Serve with Tomato Tarragon Mayo on the side for added interest. Brush both sides of tuna with oil. Cook on barbecue over medium-high heat either in a basket or on a mesh grill pan. You could do it directly on the grill but make certain the grill is clean or the fish will stick. If it is good, sushi-grade tuna (which, of course, it will be) we like it medium rare so we cook it 2 - 4 minutes a side. For more well-done cook it 6 - 8 minutes a side but try not to overcook or it becomes dry. For well-done it should just start to flake easily. You can also broil it for 4 - 6 minutes a side or sauté in a nonstick skillet for 4 - 7 minutes a side. All times depend on thickness of tuna and how well-done you want it - you may have to adjust up or down. Remove tuna from heat, sprinkle with black pepper and serve, Tomato Mayonnaise on the side. Chop tomato, mince garlic and snip herbs: hold leaves in one hand and snip with a scissors. Put into a small bowl and add mayonnaise. Mix well and serve.